Deborah Sandidge: How to get creative with your camera! How to get creative with your camera! I hope to see you at the Camera Club of Brevard in Satellite Beach, Florida Nov 2nd for my next seminar on getting creative with your camera! This discussion is about boosting your creativity, getting inspired, and trying out a few new ways to make great pictures. Please bring your questions and ideas! This photo was taken in #Rocky Mountain National Park. I completely fell for the aspens that were changing from green to orange and gold. I was encompassed by color and light, which is reflected in how I took the picture. 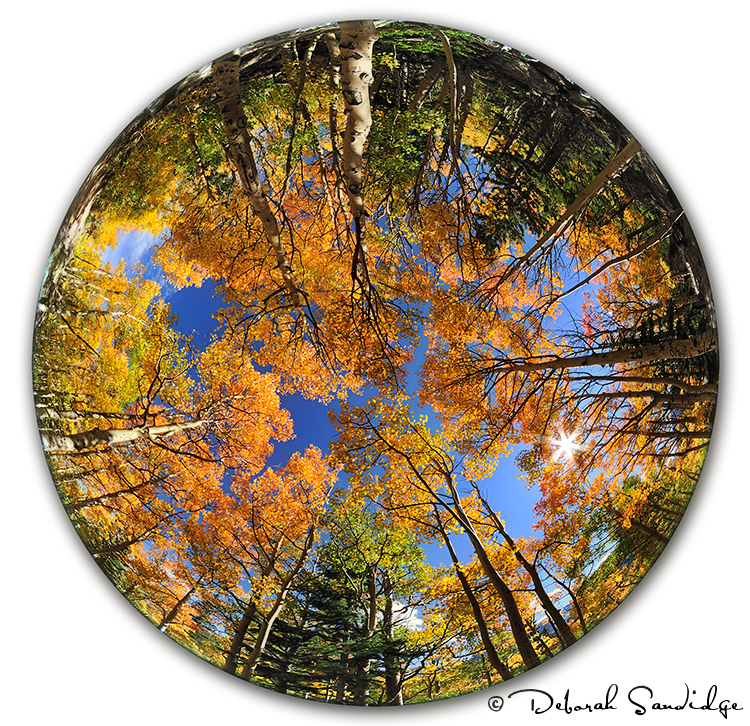 I used a Sigma 8mm circular fisheye lens to create the sense that one is surrounded by trees. A small aperture equals a big starburst, which seem to be accentuated with this lens. Try a fisheye for a little something different! Have fun shooting!